Nobel laureate Alexander Solzhenitsyn has hailed President Vladimir Putin for rebuilding Russia and accused West of trying to ignore and sideline the country. The 88-year old author, who documented the murderous Soviet prison camp system based on his own seven-year experience as a prisoner of the gulag, said the Western criticism of Russia was often unfair, according to a sprawling interview with Der Spiegel magazine that was republished Tuesday in the Russian daily Izvestia. "Of course, Russia is not a democratic country yet, it is only starting to build democracy and it's all too easy to take it to task with a long list of omissions, violations and mistakes," Solzhenitsyn was quoted as saying. "But did not Russia clearly and unambiguously offer its helping hand to the West after Sept. 11? Only a psychological inadequacy, or a disastrous shortsightedness can explain the West's irrational refusal of this hand." Putin welcomed the U.S. deployment to the formerly Soviet Central Asia for operations in Afghanistan after the Sept. 11 2001 terror attacks - an unprecedented gesture that helped boost relations but Washington. But the bilateral ties worsened again quickly amid differences over the war in Iraq and other international crises, Washington's concerns about the Kremlin's backtracking on democracy and the Kremlin's opposition to U.S. missile defense plans. Solzhenitsyn chided Washington for failing to show good will in response to Putin's friendly moves. "After accepting our vital assistance in Afghanistan, the United States immediately started making new demands to Russia," he said. "And Europe's claims to Russia are clearly rooted in its energy fears, unfounded at that," he added in a reference to the European Union's concerns about growing dependence on Russia's energy supplies and fears that Moscow may use them for political ends. "Isn't it a too big luxury for the West to push Russia aside, especially in the face of new threats?" Solzhenitsyn said. He added that an admiration of the West shared by many Russians after the Soviet collapse quickly gave way to disenchantment. "The perception of the West as mostly a "knight of democracy" has given way to the disappointing conclusion that Western policies are build on pragmatism, often cynical and selfish," Solzhenitsyn said. "For many Russians it was a hard experience, a collapse of ideals." Returning to Russia in 1994 to find a country in deep disarray, Solzhenitsyn's dismal view of 1990s Russia, along with his nationalism and hope for a resurgence of his country, has aligned him with Putin, who has presented his time in office as a period of recovery following economic and social turmoil at home and weakness on the world stage that Russia suffered after the 1991 Soviet collapse. 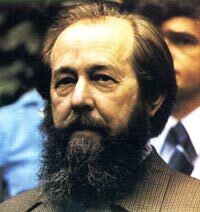 Solzhenitsyn has appeared infrequently in public in recent years, looks frail and is believed to be ailing. In rare print or broadcast interviews, he has lamented the state of Russian politics and the government, but also has praised Putin despite the president's KGB background. Last month, Putin honored Solzhenitsyn with a State Prize for "humanitarian activity." Pressed by Spiegel on how his gulag experience could be combined with praise for Putin, a 16-year old KGB veteran, Solzhenitsyn answered by saying that Putin's service in the foreign intelligence arm of the KGB set him aside from the repressive domestic secret police. "Vladimir Putin - yes, he was an officer of the special services, but he was not a KGB investigator, nor was he the head of a camp in the gulag," Solzhenitsyn said. "And foreign intelligence is not negative in any country, sometimes it even draws praise. George Bush Sr. was not much criticized for being the former chief of the CIA." Solzhenitsyn scathingly criticized Putin's predecessors, Soviet President Mikhail Gorbachev and Russia's first President Boris Yeltsin for conducting ill-planned reforms and kowtowing to the West. "The West was celebrating its victory after the exhausting Cold War," Solzhenitsyn said. "While observing the 15-year-long anarchy under Gorbachev and Yeltsin and surrendering of all positions abroad, the West quickly got accustomed to the idea that Russia had become almost a Third World country and would remain that forever. When Russia began to strengthen its economy and statehood, the West perceived that, perhaps on a subconscious level, with panic."